Proud moment: One World Hotel director of rooms Kenneth Perreau receiving the award from editor of Expatriate Lifestyle Magazine Matt Bellotti. 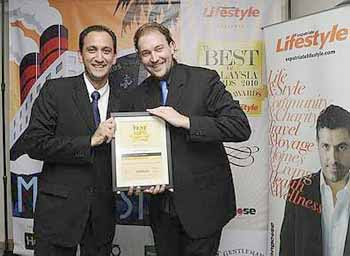 One World Hotel, Petaling Jaya, has managed to bag three awards at the recent Expatriate Lifestyle magazine’s Best of Malaysia Travel Awards 2010. The awards’ results were announced in the October 2010 issue. The hotel’s management said it was honoured and proud to have won these highly prestigious awards which were voted by hundreds of thousands expatriates living in Malaysia. One World Hotel received an Excellence Award in Best City Hotel category, Zuan Yuan Chinese Restaurant was awarded the Excellence Award for the Best Hotel Restaurant category while Thann Sanctuary Spa was recognised as the Best City Spa. For the past four years, Expatriate Lifestyle magazine had their readers cast votes for their favourites in the Best of Malaysia Awards — an annual travel and hospitality awards. It is a form of recognition and gratitude to efforts in offering the best in meeting with international standards and expectations. This year’s voting has been exceptional with increased number of votes compared to 2009.
providing the highest standards of services and facilities to guests. Its general manager Ho Hoy Sum said the hotel staff’s steadfast commitment to excellence and consistency in standards earned them these prestigious awards and winning the Best City Hotel award for consecutive years was indeed an inspiration to motivate them further in their commitment to excellence and to ensure that guests receive only the very best service from the hotel.